I am looking to edit the jump animation so it either flips EVERY TIME or not at all for the Wrath 3.3.5 client. Note that it has to add up correctly so just setting one variation to 100% won’t work, you’ll have to remove the others as well. Sorry, I'm a bit techy, but new to editing MPQ's. Could you offer me some specificity on how to make the change I'm going for? As far as i understand this, you have to extract the corresponding m2 file (the model itself) load that in an hex editor (for example 010-Editor, with an m2 template) and delete the animation you don't want to show up and for the other animation you have to change the frequency. Never worked with models but as is said, this should be the things you have to do as far as i unterstand. So extract BloodElfFemale.M2 and open with a hex editor? What am I looking for in there? Open up the corresponding model in 010 Editor and apply the m2-template (http://www.modcraft.io/index.php?topic=828.msg56532#msg56532) on said model. From this part onwards i never worked with models but my guess is you have to look for either M2Sequence and/or int16_t frequency cointained in that structure. Have you downloaded the tutorial material form the getting started section? In that pack the 010 templates should be included. 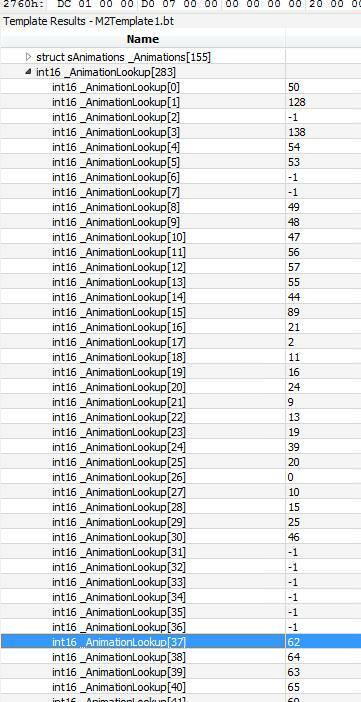 -In AnimationLookups go to id 37 (jump animation id) and replace "61" (jump sequence) by "62" (flip sequence). Now it will allways flip.